Concerns over rising interest rates and expected further rate increases have hit several stocks hard since the end of the third quarter. NASDAQ and Russell 2000 indices are already in correction territory. More importantly, Russell 2000 ETF (IWM) underperformed the larger S&P 500 ETF (SPY) by about 4 percentage points in the first half of the fourth quarter. Hedge funds and institutional investors tracked by Insider Monkey usually invest a disproportionate amount of their portfolios in smaller cap stocks. We have been receiving indications that hedge funds were paring back their overall exposure and this is one of the factors behind the recent movements in major indices. In this article, we will take a closer look at hedge fund sentiment towards Electronic Arts Inc. (NASDAQ:EA). After a huge jump in Q2, hedge fund ownership of Electronic Arts Inc. (NASDAQ:EA) was flat during Q3, as the video game publisher was owned by 79 hedge funds tracked by Insider Monkey. That was enough to hold off rival Activision Blizzard, Inc. (NASDAQ:ATVI), which had a 12% rise in hedge fund shareholders during Q3, allowing EA to retain its status as Hedge Funds’ #1 Stock Pick in Video Games. Electronic Arts also landed on our list of the 30 Most Popular Stocks Among Hedge Funds in Q3 of 2018, though it couldn’t crack the top 20. In the financial world there are a lot of indicators shareholders use to appraise their holdings. A duo of the most underrated indicators are hedge fund and insider trading indicators. We have shown that, historically, those who follow the best picks of the top fund managers can beat the broader indices by a significant margin (see the details here). What does the smart money think about Electronic Arts Inc. (NASDAQ:EA)? At Q3’s end, a total of 79 of the hedge funds tracked by Insider Monkey were bullish on this stock, unchanged from the previous quarter. 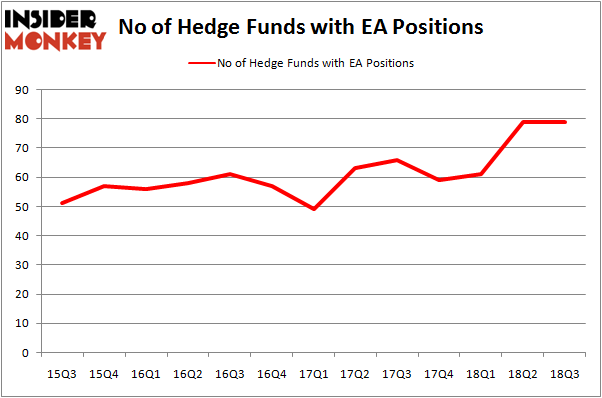 The graph below displays the number of hedge funds with bullish positions in EA over the last 13 quarters, a stat which has risen by 50% over the past 6 quarters. So, let’s find out which hedge funds were among the top holders of the stock and which hedge funds were making big moves. According to Insider Monkey’s hedge fund database, Stephen Mandel’s Lone Pine Capital has the most valuable position in Electronic Arts Inc. (NASDAQ:EA), worth close to $946.6 million, accounting for 4.9% of its total 13F portfolio. 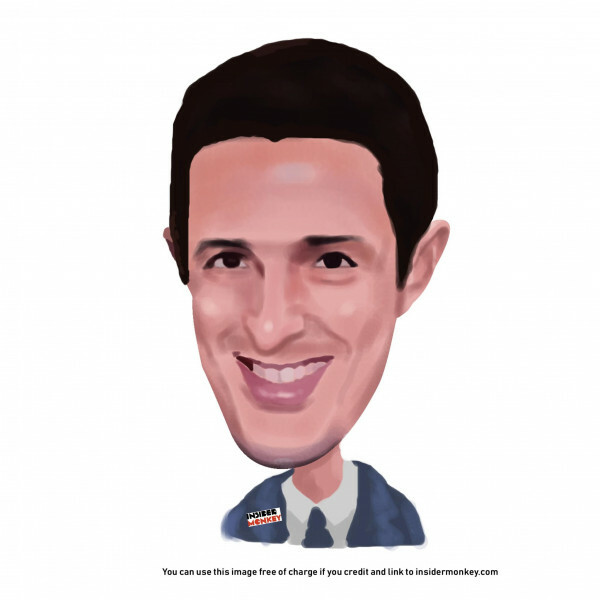 Coming in second is Gabriel Plotkin of Melvin Capital Management, with a $482.7 million position; the fund has 5.1% of its 13F portfolio invested in the stock. Other members of the smart money that are bullish encompass Gabriel Plotkin’s Melvin Capital Management, Cliff Asness’ AQR Capital Management and Steve Cohen’s Point72 Asset Management. Seeing as Electronic Arts Inc. (NASDAQ:EA) has witnessed declining sentiment from the smart money, we can see that there was a specific group of fund managers that elected to cut their positions entirely last quarter. Interestingly, John Armitage’s Egerton Capital Limited sold off the largest position of the “upper crust” of funds tracked by Insider Monkey, totaling an estimated $570 million in stock, and Dan Loeb’s Third Point was right behind this move, as the fund cut about $232.7 million worth. These moves are interesting, as total hedge fund interest stayed the same (this is a bearish signal in our experience). Let’s now review hedge fund activity in other stocks – not necessarily in the same industry as Electronic Arts Inc. (NASDAQ:EA) but similarly valued. We will take a look at TransCanada Corporation (NYSE:TRP), Air Products & Chemicals, Inc. (NYSE:APD), Edwards Lifesciences Corp (NYSE:EW), and BCE Inc. (NYSE:BCE). This group of stocks’ market caps match EA’s market cap. As you can see these stocks had an average of 26 hedge funds with bullish positions and the average amount invested in these stocks was $652 million. That figure was $4.50 billion in EA’s case. Air Products & Chemicals, Inc. (NYSE:APD) is the most popular stock in this table. On the other hand TransCanada Corporation (NYSE:TRP) is the least popular one with only 14 bullish hedge fund positions. Compared to these stocks Electronic Arts Inc. (NASDAQ:EA) is more popular among hedge funds. Considering that hedge funds are extremely fond of this stock in relation to its market cap peers, it may be a good idea to analyze it in detail and potentially include it in your portfolio.